The information panel explains it all, apologies for missing out the Bomberg. Above is 'Ebb Tide on the Reef at Clodgy' by Borlase Smart in 1943. This painting was at one time lent to Noel Riley at the Beehive for a discussion group to talk about it. 'Welsh Hills' by CRW Nevison undated and the subject of a free lunchtime talk by Sophie Cummings on 11 March 12.30-1pm, along with Wallis' boat painting. There's also a general talk by Sophie on the exhibition on Friday 12 February 12.30-1pm. It's free to everyone, so do come along. The first Friends' visit and talk of the year was to the Mount House Gallery to see Gavin Jones' exhibition of deep space astrophotography. 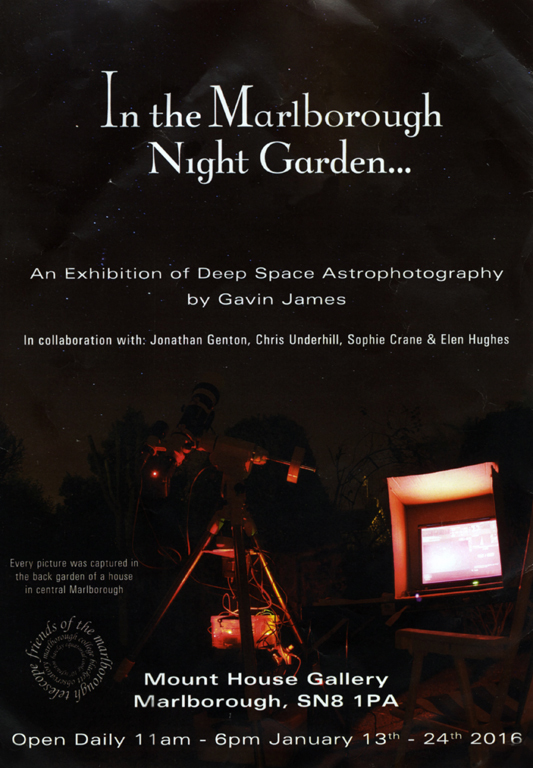 We were treated not only to the photos, but a video Gavin had made of his telescope in his back garden in Marlborough, and a detailed explanation of how the photographs were treated to enable a better view of space. 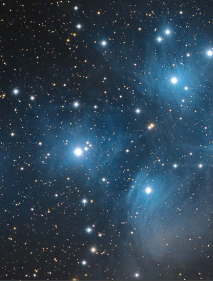 We were also treated to a session on how we perceive stars according to where they are in relation to us and each other. I am a bit hazy on the details because the group was quite large, and we split into two so that some could go to the Blackett Observatory while others stayed for the astrophotography, and I spent quite a bit of the evening ferrying people back and forth from the gallery to the observatory. The Blackett Observatory is a wonderful place, only a short distance from the Mount House Gallery, quite high up behind the tennis courts and cricket pitches, it's an amazing place, run by Director of the observatory, Charles Barclay, who guided us through the rules of looking effectively at the night sky as we sat in red light, designed to maximise our pupil size after 30 minutes and enable proper viewing. To find more about the splendid telescope and how you can have a look at it, then please click on the link to the Blackett website. Apart from the general information about the telescope, we were given information about how climate change has affected the weather to such an extent that since September, there have been very view evenings when the sky has been clear enough to see the stars before about 2am. Thank you to all who made the visit such a successful event. We meet at 7.15 for a 7.30 start at the Mount House Gallery; 1. Look at the exhibition, 2. An informal talk from Gavin James followed by Q & A, 3. 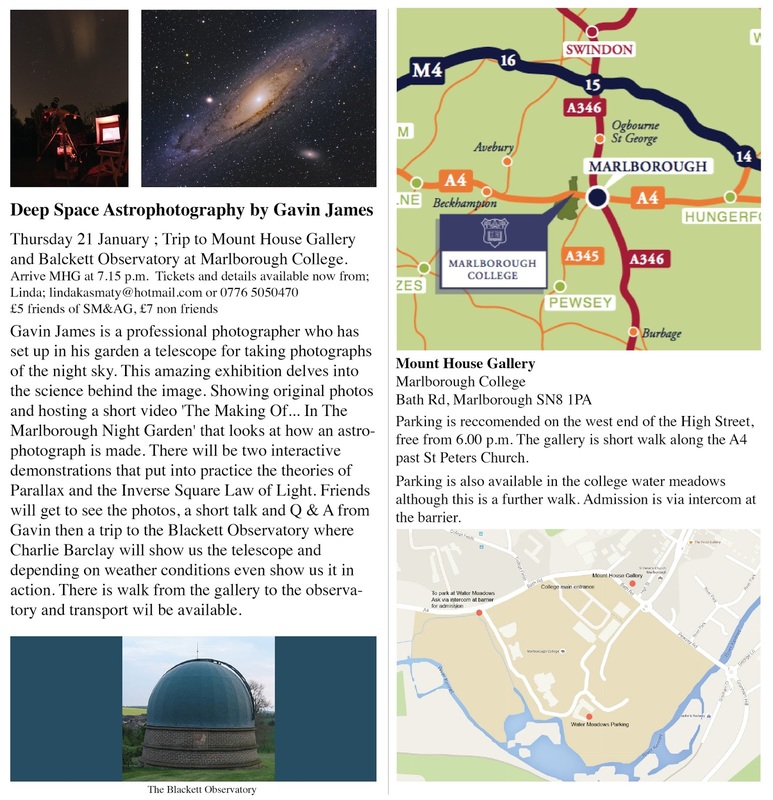 A trip to the Blackett Observatory, this is a short walk from the gallery but transport will be available for anyone who needs a lift. Then there's the talk by ceramics' collector, Mark Golder, on Thursday 31 March, illustrated by the fabulous Goathead Pot, and on Thursday 21 April, there's an Exhibition Opening evening for Friends only to the Eileen Cooper exhibition. Then we're very pleased to welcome Eileen Cooper RA to talk about the exhibition which will be in the Main Gallery, tickets are on sale now to Friends, but not until 2.4.16 for those who are not members of the Friends. There's a trip to Roche Court on 16 May, bookings taken now, and last but by no means least, a talk by Lynne Derry on the Great Bustard, find out more from Lynne. Phew, that's a long list. There are also free lunchtime talks at the museum, they will feature in a future blog piece.